Categorizing author Rohit Gaur’s sweeping debut novel Ganesha’s Temple as a straightforward work of fantasy would be misleading. Sure, the 280-page volume offers readers many boilerplate elements of the standard fantasy plot, including a young hero — in this case, 14-year-old Tarun Sharma, a young man from Kashmir —who sets out on an epic quest that carries monumental consequences. But, although the basic structure of the novel recalls plot points from works ranging from The Lord of the Rings to C.S. Lewis’ Narnia series, Gaur’s novel offers a unique twist on the old formula. First, the fantastic realms, mystical creatures and magical components of Gaur’s plot have roots in the Hindu religion. What’s more, Tarun’s quest begins in the very contemporary and very real setting of modern-day Kashmir. As it unwinds, the plot fuses ancient Hindu mythology, contemporary politics and traditional fantasy narrative. At the story’s start, rebels kidnap Tarun and his mother after a staged attack during a four-day festival celebrating the four-armed god Ganesha; Tarun escapes, but the book follows his quest to reunite his family. That effort brings Tarun face-to-face with Ganesha himself, who sets the young hero on a journey to the mystical setting of the Veiled Lands. The god directs him to recover three magical objects hidden in the mystical world, tokens that will restore the god’s powers and, ultimately, reunite his family. With a straightforward, clear narrative style that seems tailored for young readers, Gaur handles this ambitious mix of elements with consistent skill. Descriptions of modern-day Kashmir blend well with Tarun’s interactions with Ganesha and his voyage through the Veiled Lands. Ganesha’s Temple never gets bogged down by the weight of its own considerable goals. 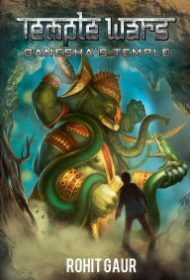 Gaur’s prose is well-suited for young readers, and while Ganesha’s Temple may seem a bit too simple for older, more experienced fantasy readers, it’s a fascinating and compelling entry into the genre.